TimeKeeper is a small application I wrote to monitor and record my time throughout my working day. It is designed to be an extremely simple and low impact way to record time spent on different projects and activities. 2012-12-06: Version 3.0 - Allow HH:MM times in math equations. Now you may write 1:05+1:30 for a total of 2:35 (or 2.58) hours. 2013-01-22: Version 3.2 - New settings for optional features; Long project codes; Allow time display in HH:MM format; Better defaults for summary reports. Total time includes current project only if both code and description are not blank. It uses a simple text file to record the number of hours to 2 decimal places, a project code up to 10 characters long and a detailed description of the activity of unlimited length. A new text file is created for each calendar day, in the current directory, named as TimeLog.CCYYMMDD.txt. The files can be subesequently organized into whatever directory structure suits for long term storage. The current day’s file is opened and closed for each write and only when the record button is clicked, which means it can be manually edited with any text editor, even while TimeKeeper is running. A facility to quickly add time logs for holidays, vacations and other special days exists to allow a complete record with every day accounted for, and allowing holidays to be accounted for as paid time. Likewise, a very simply mechanism exists to generate a summary for any specific period of time. The summary generator scans entire directory trees allowing time logs filed in subdirectories. It also treats the predefined project codes specially to calculate real time off over a given period. 1.37  TIMEKEEPER  Work up special day recorder. 3.83  TIMEKEEPER  Add summary generator. 4.50  TIMEKEEPER  Write help text. 0.12  OVERHEAD    Backup. Submit day log. 10.29  *TOTAL      Total time spent on work related activities. 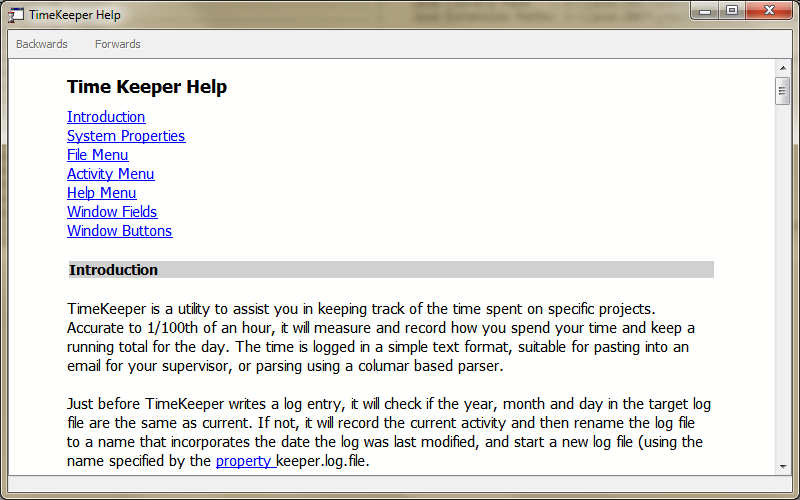 Download TimeKeeper 3.2 or the previous stable version TimeKeeper 3.0. This program requires the Java Runtime Engine V6 or later to run. The JRE need only be installed once to run any number of Java applications. If you are unsure whether you already have the JRE installed you can check it on the Java website using the “Do I have Java?” link.